Happy $900 Billion Day! Today we celebrate the outstanding student loan debt clock flipping over the $900 billion mark. How does outstanding student debt compare to other debts? 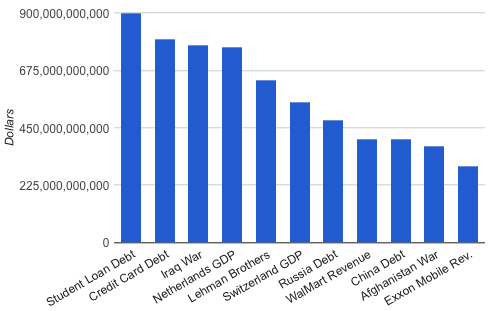 Student debt now outweighs credit card debt; the external debt of Russia and China (among others); the cost of the wars in Iraq and Afghanistan (but, at least, not combined); the pre-filing assets of Lehman Brothers, the largest bankruptcy; the GDPs of the Netherlands and Switzerland (among many others); the revenues of every single company in the world, including the two highest, WalMart and Exxon Mobile. I considered adding Harvard University’s endowment ($28 billion) and the principal losses in the Madoff Ponzi scheme ($18 billion), but these numbers were negligible. It’s hard to find things to compare to student loan debt. All the numbers are so astronomical and intangible, all comparisons become meaningless.